Between flashy new premieres and perennial favorites, there are thousands of works that, for whatever reason, don’t appear on concert programs very frequently. Fortunately, Music Director Ludovic Morlot has an incredible flair for discovering some of these hidden gems of the orchestral repertoire to share with Seattle Symphony audiences. Here is your guide to nine overlooked masterpieces and rarely heard composers that you won’t want to miss during the Seattle Symphony’s 2016–2017 season. Elgar is best known for his cello concerto and his beloved Enigma Variations, but his choral masterpiece, The Dream of Gerontius, is arguably one of his greatest compositions. It is certainly one of his deepest felt and most emotional works and should be at the top of your list this season. Based on a poem by John Henry Newman, the music traces the journey of the soul after death. The main character, Gerontius, is a man of faith who we find upon his deathbed. During the first half Gerontius is preparing for his imminent death. In the second part he has passed on and is met by an angel who guides him through the afterlife. At a critical moment he briefly glimpses God upon his throne and is instantly judged. The work concludes with Gerontius being lowered into the lake of Purgatory with the promise that he will one day reawaken into eternal glory. Edward Gardner, former Music Director of the English National Opera and Chief Conductor of the Bergen Philharmonic Orchestra, will lead the Seattle Symphony and Chorale in performances on December 1 and 3, 2016. Composed in Paris between November 15, 1943 and March 15, 1944 during the German occupation, Messiaen’s Trois petites liturgies de la Présence Divine was his first major orchestral work after being released from a prison camp in Silesia in 1941. Scored for piano solo, 36 female voices, percussion ensemble and strings, Messiaen also includes an instrument rarely heard on symphonic programs: the Ondes Martenot. An early electronic instrument, the eerie, wavering sound is similar to that of the theremin. The strings and voices lend Messiaen’s orchestration a rich, lush timbre that contrasts with the brilliance of the percussion and piano. Since picking up the baton at the Seattle Symphony in 2011, Morlot has been introducing Seattle audiences to Messiaen’s music, including the Turangalîla Symphony in 2013. He will conduct Messiaen’s Trois petites liturgies and Beethoven’s Symphony No. 9 on January 5, 7 and 8 with the Seattle Symphony and Chorale and the Northwest Boychoir. The music of Ives can be extraordinarily beautiful, and the opening movement of his New England Holidays is no exception. Entitled Washington’s Birthday, it is the first of four movements that commemorate a different holiday from each season of the year. The entire piece is characterized by Ives’ idiosyncratic use of dissonance and clashing melodic lines, which can make it hard to follow the music at first. When listening to Ives, it’s helpful to imagine that you’re moving through a landscape with competing sounds — not unlike the experience of walking around a city. Like any good artist, he heightens and dramatizes the experience. Listen for how Ives swirls sounds around, forces them to collide together and then opens space for reflection. Morlot conducts the music of Ives and Beethoven’s Piano Concerto No. 5, “Emperor” with Emanuel Ax on February 2 and 4. On June 10, 1942 the Nazis swept into Lidice, a small village outside of Prague, and obliterated the town. When they finished, there was no sign that it had existed. The men were massacred and the women and children were either killed or sent to concentration camps. The town itself was burned down, the lake filled in and the rubble was ploughed into the ground. At that time, Martinů was living in Connecticut after fleeing Europe to seek refuge in the United States. As the story spread during the following year, he wrote his symphonic poem, Memorial to Lidice, to honor his fellow Czech citizens who lost their lives. The music opens in two jarringly conflicting keys — C minor and C-sharp minor. Towards the end he quotes the “fate” motive from Beethoven’s Symphony No. 5 before the music resolves into a restful C major. Morlot will conduct Martinů’s Memorial to Lidice and Beethoven’s Symphony No. 5 on March 23 and 25. The music of Japanese composer Toru Takemitsu is heavily influenced by French composers Claude Debussy and Olivier Messiaen. All three are masters of color and timbre, but Takemitsu’s approach is very different, using moments of silence to great effect. A prolific film and television composer as well as a great symphonist, Takemitsu’s exquisitely orchestrated score for the film Nami no bon rarely appears on symphonic programs, but the music is simply gorgeous. It alternates between moments of eerie, suspenseful writing and lush, nostalgic tonality. You can hear Takemitsu’s Nami no bon at Celebrate Asia on March 26. Erkki-Sven Tüür is part of the vibrant contemporary classical music scene in Tallinn, Estonia. His contemporary, Arvo Pärt, is better known in the United States, but Tüür’s music deserves our equal attention. Choral pieces are a major fixture in Estonian music, and Tüür’s soaring and lyrical style reflects the influence of this rich and vibrant tradition. His string writing employs complex textures of harmony and counterpoint that invite us into a vast, mysterious world. You can hear Erkki-Sven Tüür’s De Profundis on April 13 and 15. Although this is by far Zemlinsky’s most famous work, you could be forgiven for not having heard it before. It was premiered alongside Pelleas und Melisande by his student, Arnold Schoenberg, in 1905 and received few subsequent performances. Zemlinsky fled Germany in 1938, taking only the last two movements of the score. (He gave the first movement to Schoenberg’s librettist, Marie Pappenheim.) The score was reassembled by musicologists Peter Gülke, Ernst Hilmar and Alfred Clayton and first performed again in 1984. The music is in the vein of Brahms, Mahler or Wagner, with thick, complex orchestrations that dissipate into floating, ethereal moments in the winds. The story should be familiar to anyone that has seen Disney’s The Little Mermaid, but with a different ending: the mermaid does not live happily after. The Prince ultimately marries another women and the mermaid must choose between stabbing him and returning to the sea or dying herself. In the end, she throws the knife into the sea and, in good Romantic fashion, dissolves to join the spirits in the sky who fly about doing good deeds. You can hear Zemlinsky’s The Mermaid on April 27 and 29 alongside Tchaikovsky’s iconic Piano Concerto No. 1. Ravel is no stranger to orchestral programs, but the music of his opera, L’enfant et les sortilèges, does not appear frequently. This year Morlot is presenting a semi-staged version of the one-act opera. The libretto was written by French author Sidonie-Gabrielle Colette in about eight days in 1917. Ravel completed the music between 1917 and 1925. Colette’s libretto tells the story of a rude and spoiled child who delights in torturing his toys. He is surprised when the toys and animals come to life around him one day and shun him for his previous misbehavior. Eventually the toys and animals attack him but, during the fighting, a squirrel is injured. After the child bandages the squirrel, the other animals take pity on him and carry him back to his house. Ravel’s opera will be performed on June 1 and 3 by Soraya Mafi, soprano; Sydney Mancasola, soprano; Michèle Losier, mezzo-soprano; Jean-Paul Fouchécourt, tenor; Alexandre Duhamel, baritone; the Northwest Boychoir; and the Seattle Symphony and Chorale. Even if you’ve never heard of composer György Ligeti, chances are that you’ve heard the Kyrie movement from his Requiem. The mass of voices appears in the iconic film, 2001: A Space Odyssey, and infuses the film with a sense of dread. Ligeti was a master of color and timbre, and he defies our expectations by introducing mesmerizingly thick, cloud-like textures of sound that grow, shift and decay. Instead of a calming promise of eternal rest, we hear hundreds of voices crying out to us. We lose our place in time as we are carried along in their lament. 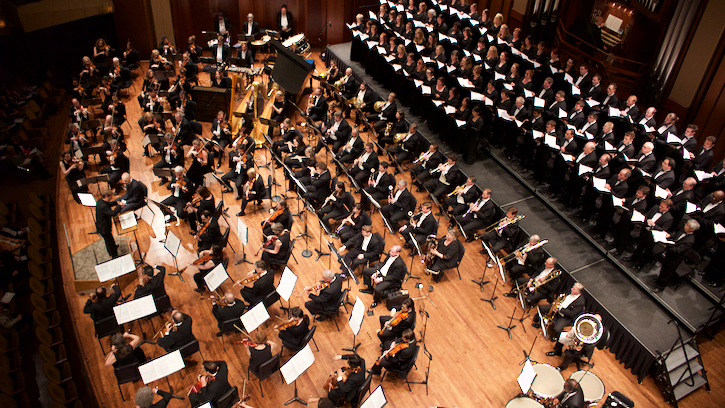 Don’t miss the season-closing concert featuring Ligeti’s Requiem and Mahler’s Symphony No. 5 on June 22, 23 and 24. If I had to pick three works that you should absolutely not miss, I would nominate Elgar’s The Dream of Gerontius, Messiaen’s Trois petites liturgies de la Présence Divine and Ravel’s L’enfant et les sortilèges. Which work are you most looking forward to hearing? Share with us on Facebook and Twitter. If you’re interested in contemporary music, then make sure you read our guide to the premieres taking place at the Seattle Symphony this year. Enjoy, and as always, listen boldly! You can purchase tickets online or by calling the Ticket Office at 206.215.4747.